I found this new-to-me technique while working with some chipboard. I always felt glitter was so pretty it needed to have a full and solid coat but did you know that sometimes a little goes a long way? I thought I would dive into a couple of techniques over the next few projects that would add just the right amount of glitz. In this LO I also used some Bronze, Ritzy Ditzy Glitz and spritzed the bottom corners of the center pink paper to add more "Grunge". For a good solid coat of glitter on chipboard I have always used Wonder Film. It makes a spectacular finish. But on this layout I was distressing a lot with my inks and felt it I wanted a distressed title due to the subject matter (this is a pet that is no longer with us). So I took out my Helmar Gemstone Glue (It wont cloud Gemstones and I figured it would be a good glue to use with glitter) put a little pile of it on my splat mat and started painting it onto my letters with my finger. Making sure to get different thicknesses and not always getting the edges. Dusting it immediately with chocolate Glitter Glitz made this title just the way I want it. Still tons of glitz but with a kinda grungy, distressed look around the edges. I am so organized now in my scrappy space that I have been able to make my projects so much faster. Finding everything I need where it should be saves so much time it allows me to play with my products a bit more. 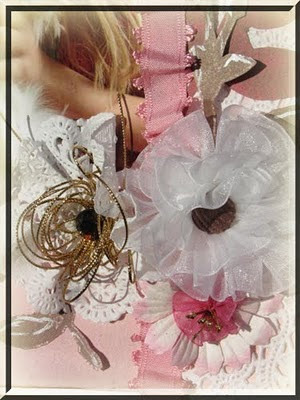 Below I am showing you some of the ribbon and doily flowers I made for this LO. Hope you enjoy! Happy Scrapping and hope you get some time to be creative today! Share with me the link if you do. I love to see peoples projects!